As of the end of last month, there were 4,873 active listings of homes and condos for sale in the counties of St Louis and St Charles, the lowest inventory of homes for sale for those two counties in over 10 years. 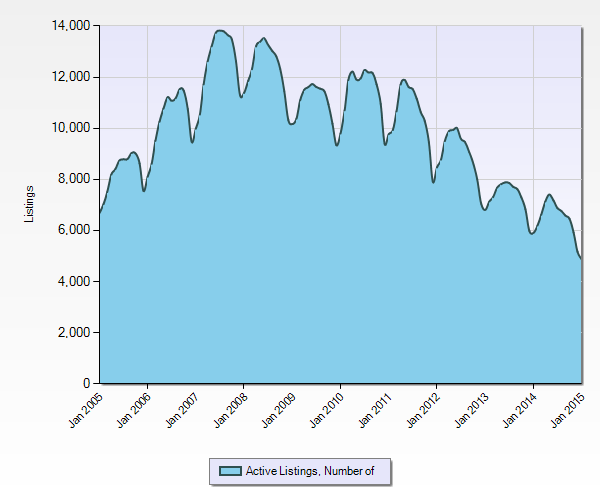 As the 10-year chart below shows, the inventory peaked at 13, 823 active listings in July 0f 2007 so the inventory of homes for sale in St Louis & St Charles County has fallen almost 65% since hitting the peak during 2007. It’s no wonder we are seeing many homes selling within days of hitting the market, and, often at or above full asking price. Of course, as I have said before, home buyers today are pretty savvy so they are not jumping at overpriced listings but if they are priced appropriately and properly marketed, they are gone quick!